Discussion in 'Transformers Animated Discussion' started by Ravenxl7, Mar 5, 2008. Hey all. I was bored, so I decided to come up with a size comparison photo of the Voyager sized Bulkhead and Lugnut toys. I'm hoping we do see a Leader sized Lugnut toy at some point, but I'm not going to hold my breath for one. My currenty plan is to get the Voyager versions of them, so that they are in scale with each other. That and it's cheaper, lol. Especially since I currently plan to get most of the Animated line. Their size compared to each other is just about perfect to their size in the show. Maaaan it looks alot like they made Lugnut thinking "Bulkhead needs some kind of rival!" Heh, Bulky makes Lugnut look kinda puny. Lugnut's toy makes me sad. I LOVE the character (He's like a more narrow-minded and obsessively loyal version of Cyclonus, which is AWESOME! ), but the fact he's a small Voyager is such a disappointment. I think I'll pass on him and go with the Leader Bulkster in the hopes Hasbro will make a Bignut. ...until they release a Leader size version like they're doing with Bulkhead - which I'm literally willing to bet money that they will do with this guy as well. No one should panic yet. Or more importantly, no one should rush out and start buying advanced eBay auctions of Lugnut yet. Hopefully they do come out with a Leader Lugnut at some point. Even if they do, I still want to get the Voyager version, so I could very well end up getting 2 versions of both Bulkhead and Lugnut. A Leader Lugnut would be one that the Headmaster gimmick most likely wouldn't be possible like it is for the other Leader class figures. Lugnut's mouth movement would be really easy for Hasbro/Takara to engineer into a Leader class toy (easier than the other 3 anyways). His transfomration wouldn't need to be much, if any different than the Voyager's to get close to the Animation model. 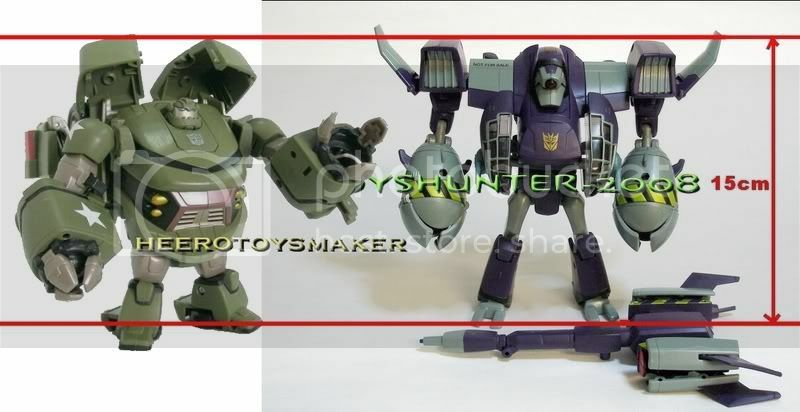 Unfortunetly there is a chance that Lugnut won't get a Leader class toy, but with the way this line is going, there's still a very good chance that he will. Another leader toy wouldn't too healthy on my coffers.. I wish people would stop saying they're small voyagers, because they're not. They're short voyagers deffinately, but they still have the Voyager heft and mass. Lugnut turns into a big plane, that takes up space. It's Cybertron Jetfire all over again. Personally, I think the selling point for Lugnut and Bulkhead are eachother. Since it's been said that they're going to have more run-ins over who's stronger later in the show, it makes sense they each have a decent, fair sized figure that is in scale with the other. Still think both these guys are great, and now that I see they're both in scale, I have a reason to buy them other than Awesomeness alone. I agree with everything that you said buuuuuut... "Since it's been said that they're going to have more run-ins over who's stronger later in the show" who said that? I also agree with this. People often look at how tall a figure is, and only how tall a figure is. Also, for those expecting the Animated toy line to be all in-scale with each other, keep on dreaming. This hasn't happened yet with a TF toy line, and most likely won't every happen (Alternators/Binaltech had scaled alt-modes, but that was one of the things that made that line what it was). I can't remember it every being specifically said, but I do remember something about them being the others main Decepticon enemy (or something to that affect). I believe one of the official promos for the show called Lugnut the "Hulk" to Bulkhead's "Thing".